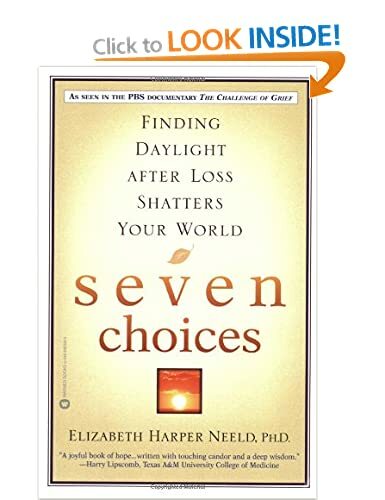 I’m currently reading an excellent book called “Seven Choices – finding daylight after loss shatters your world” by Dr Elizabeth Harper Neeld. It’s the account of Dr Neeld as she works through the emotions she feels after the loss of her husband to a very sudden death. Her story resonates deeply with my own situation. Some of the things she writes are especially challenging and I’d like to share one of those challenging thoughts here. Something which she has picked up on, which I strongly recognise, is the double loss of losing someone so close, not only have we lost the person as an individual but we have also lost our “Assumed Future”. We all have an assumption about how our future will pan out, even if it is not explicitly written in a life goal (as mine was) we will have a general feeling or an idea about where life is taking us. Visits to the park, Christmas’ shared, birthdays celebrated together and even things further off – we imagine growing old, how life will be once our own children have grown up and the time we can share with each other in the future. I’m not just talking about myself here, I’m talking about Claire’s sister, brother, mum, dad and my own kids. We all had an assumption about how life could possibly be in the future and we now have to face the loss of that as well as the loss of Claire herself. In fact anyone that knew Claire would also have had these assumptions about the future and how they would share their lives together in years to come. This deep loss leads us to a place of despair. Despair is a word, indeed an emotion which I have never considered before. Of course I knew what the word meant academically, but now I know what it means to experience it myself. As Dr Neeld points out, and this takes some deep thought, the fact that we are experiencing this despair means that our assumptions have been destroyed, and when assumptions are destroyed it opens up enormous possibilities. Wow, what a paradox! When I did my creativity module of my MBA we spent many months looking at how assumptions by people in business stifle creativity and how breaking down those assumptions about their ‘given future’ in their career would massively help the business and greatly improve creativity. Without assumptions all we are left with is possibilities. And there is the irony! The truth is that if we feel that despair then we also have a world of possibilities. The challenge now is to allow those possibilities to happen at the same time as giving despair the respect it deserves. Claire. My head knows that this is the truth and this is the kind of discussion I truly miss. Ironically, we could have spent a couple of hours discussing this and I know in my heart that you would have come to the same conclusion. You would have recognised the paradox of despair and possibility, indeed with your counselling training you may already have done so. I’m not going to lie, my heart feels differently. All I can feel at the moment is despair, I know the possibilites are out there and I guess that the first stage is recognising that – accepting and looking for those possibilities is something I can work towards. Goodnight sweetheart, I love you.